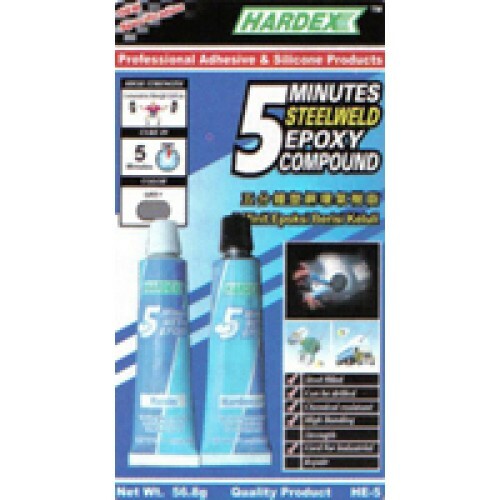 5 Minutes Steelweld Epoxy Compound Hardex High Strength 5 Minutes Metal Weld Epoxy Compound is a two-component Epoxy that cures in 5 minutes. 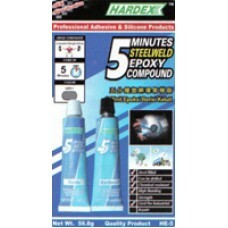 Upon full curing after 8 hours, Hardex 5 Minute Metal Epoxy becomes exceptionally strong and hard. It is versatile, shock resistant and tolerant to most fuels and solvents. It can cure tough, steel filled materials that can be drilled, tapped and sanded. Applications include repairing a wide range of materials including metal, wood, concrete, ceramic etc.